Provide amazing year round foliage interest for hanging baskets and planters! Gorgeous golden yellow leaves have a sumptuous red central leaf marking. A real alternative to trailing ivies as a base plant for all year round baskets and tubs. Totally hardy to below -10C, so works well with trailing pansies in autumn and winter. 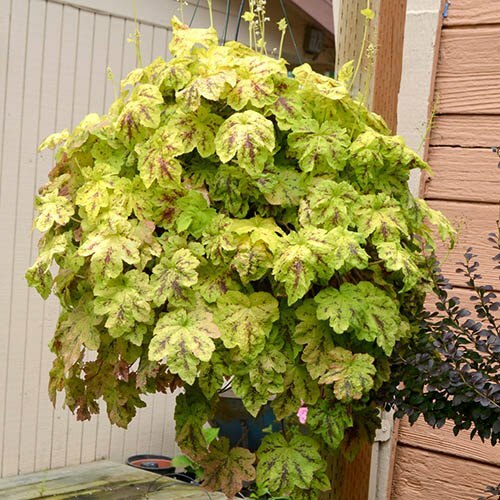 From a fabulous and successful breeding program in the USA, this new fully trailing and full hardy Heucherella provides amazing year round foliage interest for hanging baskets and planters. Trailing up to 2 feet (60cm) in a year, the gorgeous golden yellow leaves have a sumptuous red central leaf marking, more pronounced in cooler autumn and spring. A real alternative to trailing ivies as a base plant for all year round baskets and tubs. Totally hardy to below -10C, so works well with trailing pansies in autumn and winter, or with brighter summer bedding. Will also grow as a groundcover plant if planted direct in borders, covering an area of 1 square metre in a year. 'Sunrise Falls' really is a great new hardy option for many uses, with the added benefit of compact stems of frothy white flowers in summer too.